It’s a natural instinct to wonder who is viewing your Twitter profile and your Tweets, but while plenty of services claim to offer this feature, it’s really not possible. 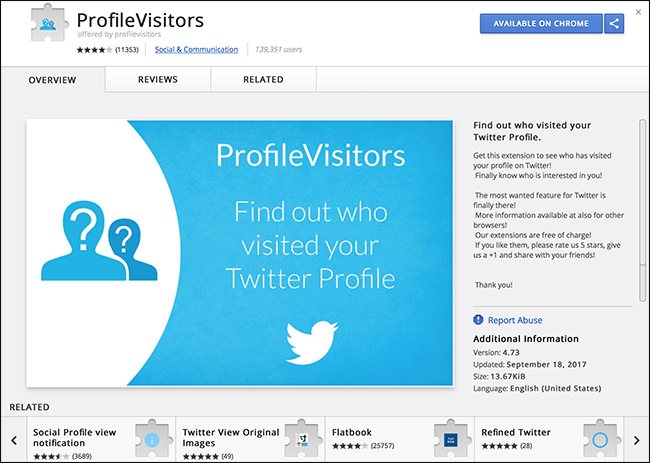 Like with Facebook, it’s easy to find browser extensions that claim to let you know who’s viewed your Twitter Profile. We recommend being careful installing browser extensions from companies you don’t trust, and most extensions that offer these features don’t come from big, reputable companies. Plus, even the extensions that are not outright scams just trying to steal your data won’t work the way you hope. Instead, they only notify you when someone else who also has the extension installed visits your Twitter profile. 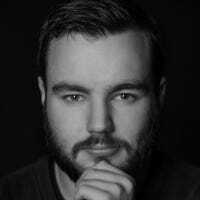 While that sounds like it might be interesting, this means the extension is keeping track of every site you visit in case you visit someone’s profile who also has the extension installed. I’m not sure about you, but I definitely don’t think providing an extension with all my browsing data is a good trade off to possibly be notified if someone else who happens to use the same extension views my profile. There are also some third-party services that aren’t browser extensions out there, but they still oversell what they can do. These services all plug into Twitter’s API and can indeed do things like notify you when you gain or lose a follower, or when someone mentions you. But that’s hardly the same as telling you who views your profile or a specific Tweet. The better engagement tracking services like Crowdfire don’t oversell what they can do. Unlike with Facebook, there is actually a way to get some information on how many people are viewing your profile or your tweets. 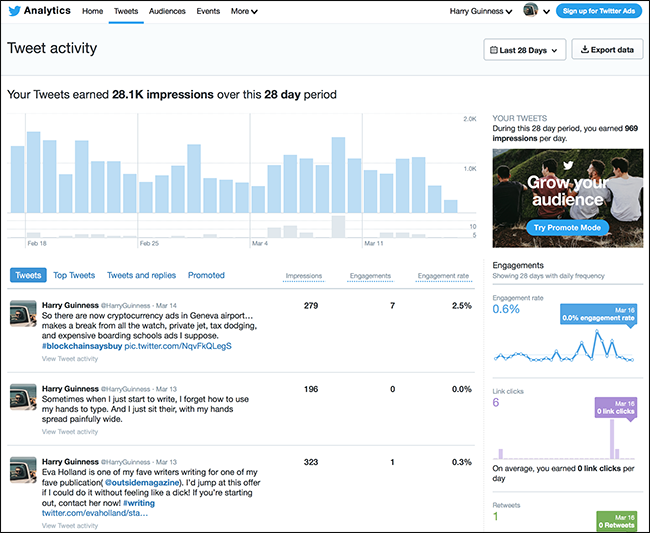 Go to Twitter’s analytics page and log in with your Twitter account. You’ll see something like this. You can see that in the last 28 days, I’ve tweeted 52 times. In total, my Tweets have been seen by 28,100 people. 758 people have visited my profile, and I’ve been mentioned 60 times. My top tweet this month was seen by 910 people. 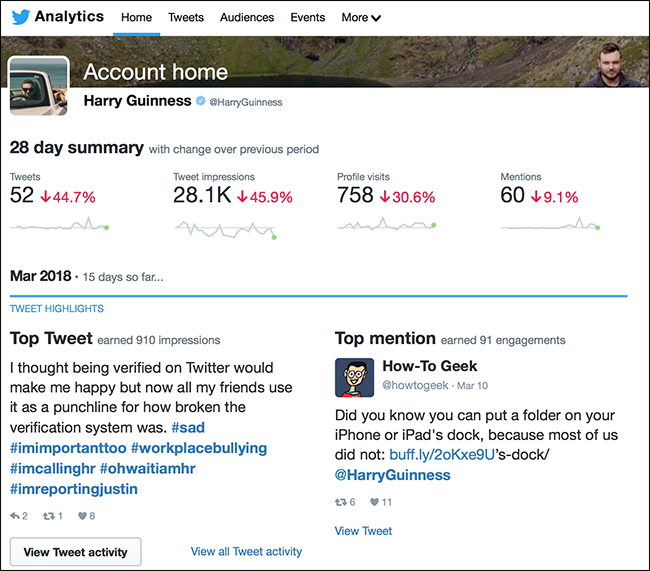 Click over to the “Tweets” page and you get a daily, tweet-by-tweet break down of how many people saw and engaged with your tweets. 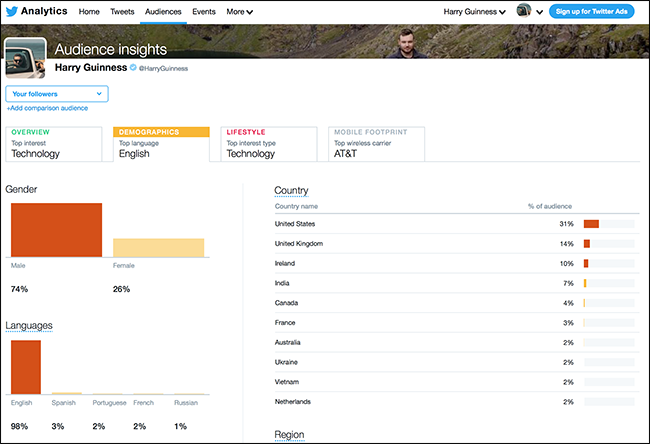 Similarly, the “Audiences” page shows broad demographics about the people who follow you or see your tweets. You can see things like where they’re from, the gender they reported to Twitter, and their language. While all this is interesting stuff—and somewhat useful if you’re trying to build a brand or get a broad overview of activity, it’s of almost no use if you’re trying to work out whether your crush or your boss is checking out your Twitter account.